Are your blog posts ranking lower in search than you’d like? Do you want to rank higher for specific keywords? In this article, you’ll discover tools and tips to help you improve the search ranking of your blog posts. 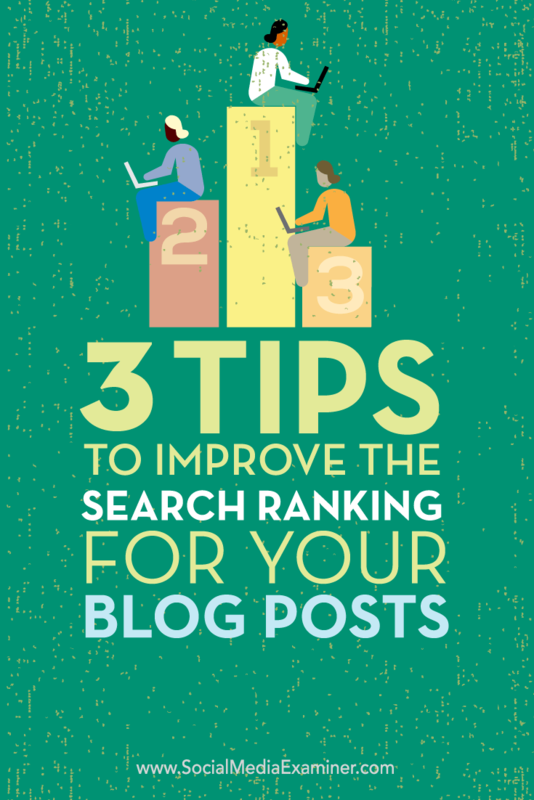 Discover three ways to improve your blog post search ranking. Optimizing your blog post to rank high in search engines used to be straightforward: pick your keyword and make sure you use it in the title and a few more times in the article. If you picked the right keyword (and if your blog was well-established and referenced), you were most likely to rank somewhere in top 10. Keyword research has quietly changed over the past few years. First, search engines like Google have become much more sophisticated when it comes to understanding what “high-quality content” is. It’s not only about how well your article is optimized: it’s also how in-depth, useful, and comprehensive it is. Moreover, as Neil Patel explains, keyword stuffing will get you penalized, not rewarded. Second, the competition is growing: most bloggers know the basics of search engine optimization these days. It’s harder to stand out and get ranked. Here’s how you can get ahead of your competitors. The days when you wrote one blog post per keyword are gone. Google (as well as your audience) now looks for more in-depth long-form content that features a varied vocabulary including synonyms, related phrases, and concepts. Use tools like Soolve to expand your list of keywords. Seed Keywords helps you crowdsource your friends and followers into suggesting related keywords for you. 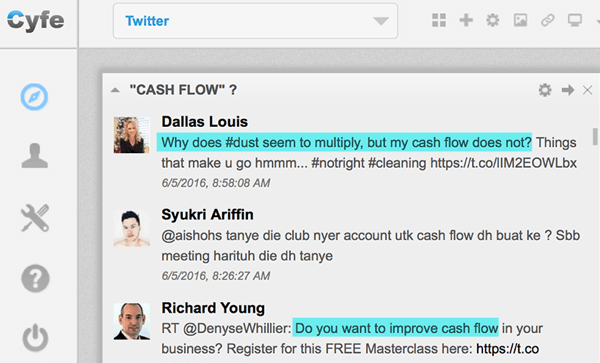 The tool creates shareable mini-surveys for your followers to help you brainstorm more ways to search for your topic. Soovle will generate keyword suggestions from multiple sources (Wikipedia, Amazon, YouTube, Yahoo, Answers.com, and Bing), giving you a good overview of how people search for your keyword on different platforms. Another tool that does the same (but supports fewer sources) is the Google Keyword Suggest Tool. It generates suggestions from Google, Bing, YouTube, and Amazon and it digs very deep, so you’ll get hundreds of phrases to work with. Reference.com and Synonym.com will help you expand your keyword list with synonyms. Synonyms are a great way to expand keyword lists. If you’re looking to optimize your existing blog posts, use Serpstat to go through your site, pick the most powerful pages, and suggest a list of “missing keywords.” Essentially, these are words your competitors are ranking high for, but you’re not. Connection Strength refers to the number of competitors that rank for the keyword that you don’t have on your page. Now all you need to do is go back to your articles and optimize them for those missing keywords to increase your ranking. An easy way to optimize existing content for new keywords is to add new sections (with subheadings) targeting those new words. This helps content get more comprehensive over time, which naturally results in more social media shares and backlinks. One of the biggest changes in search engine optimization is Google’s focus on understanding entities. “Entities” are related notable people, places, organizations, brands, etc., which associate in some way with your keyword. For the easiest way to demonstrate how entities help in ranking your content, read this awesome case study by Bill Slawski. Bill took a well-optimized piece and rewrote it the following way: first by making it much longer, and second by including notable events and people. The result was astounding. The article started to drive referral traffic from people linking to it, and return visits. And yes, better search rankings too! Google pays special attention to entities when trying to understand how concise and useful your content is. Google has had years to learn to understand entities, concepts, and their relationships. Google pays close attention to entities and how they relate to your content. Google’s Knowledge Graph is an entity graph. 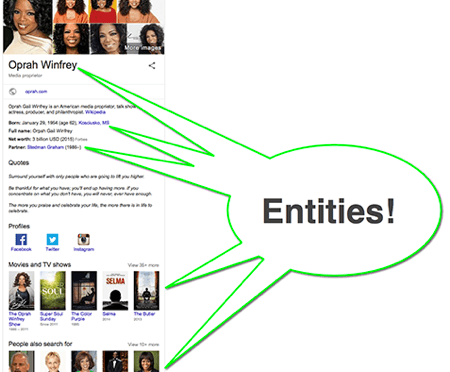 Search for any notable name you’re aware of to see how Google structures and relates entities. To research related entities, use your own common sense. Chances are you already know a lot about your content’s topic. Next, search Google. In some cases, Google suggests related concepts while you’re still typing your query. 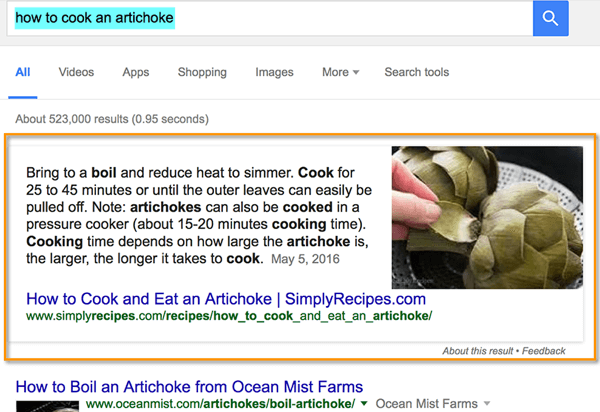 Google uses entities to verify how concise and useful your content is. Run content that ranks well through an entity extractor. Pick a few in-depth articles on your topics and run the content through AlchemyAPI (alternative tools: TextRazor and Open Calais). 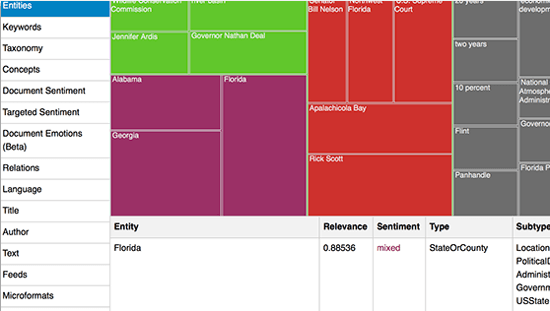 AlchemyAPI extracts entities from the content using color-coding to mark up sentiment. Run several long-form articles on your topic through AlchemyAPI and you’ll have a solid list of related entities. Another area Google focuses heavily on these days is measuring the ability of content to answer popular niche questions. You might have noticed Google’s “quick answer boxes” each time you type a question into the search box. Is your content answering popular niche questions? 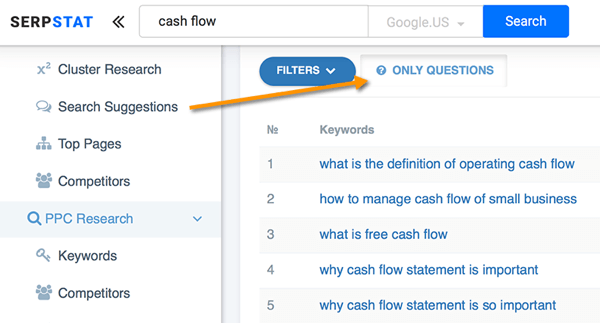 It’s important to make question research part of your keyword research each time you’re writing a blog post. The aforementioned Serpstat does question-focused keyword research, too. There’s no visualization, but it returns some unique results, which are free. This is a whole list of content ideas for you to use! 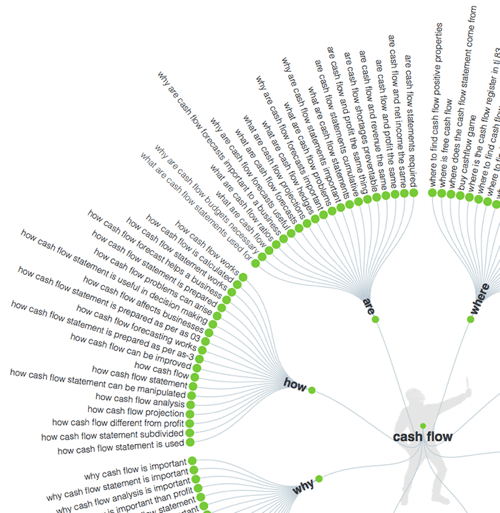 Answer The Public is a cool tool for content inspiration and question-focused keyword research. Type any word into Answer The Public to see a visualization of various types of questions people ask using that word. The question modifiers are: which, who, what, when, why, how, are, and where. Answer The Public is great for content inspiration. 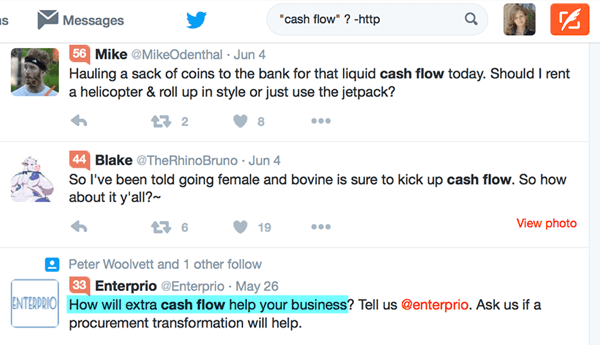 Another trick is to research niche questions using Twitter Advanced Search. While it won’t deliver as many content-worthy results, it will help you research and use natural language (which is something Google is focusing on as well, especially for mobile search). To find questions on Twitter, search any keyword with a question mark placed one space away, like this: “keyword ?” This filters Twitter search results to those containing a question. You can search Twitter for updates containing questions. You can use Cyfe to monitor and archive the Twitter search results. Cyfe searchable Twitter search archives can provide inspiration when you’re stuck. Keyword research has evolved, and it’s definitely more complicated. At the same time, though, it’s also more diverse. It encourages you to create in-depth content and works wonders for inspiration. What do you think? Are there any unique keyword research tools you’d like to share? Please post them in the comments below! 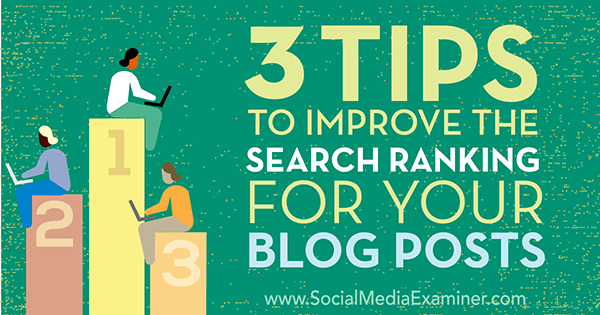 Tips on three ways to improve the search ranking for your blog posts. Ann Smarty is an experienced blogger, manager at Social Media Promotion platform and author of Social Media Promotion Guide, and owner of MyBlogGuest.com—the ethical community of guest bloggers. If you are serious about guest posting, join us! Follow Ann on Twitter; @seosmarty and @myblogguest.